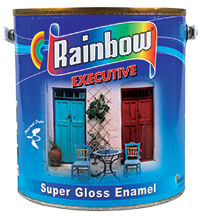 Rainbow Super Gloss Enamel is a top quality synthetic gloss finish. This is based on high quality synthetic resin and high quality light fast pigments. It has good gloss and tough finish. 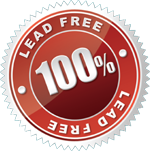 The product is used for better gloss and sustained finish. Smoothen the surface by sand paper and apply a coat of Rainbow Undercoat followed by filling. After filling is dry sand paper the surface and apply 2 coats of Rainbow Super Gloss Enamel. In case the oil is coming out from the wood, remove oil by scraping and seal the oily portion by shellac solution prior to final painting. Remove all the rust by sanding, rust removing solution or by flame, and then apply one coat of Rainbow Red Oxide Primer followed by 2 coats of Rainbow Super Gloss Enamel. Composition: Based on oil modified Alkyd Resin and light fast pigments for better gloss and sustained finish. Covering Capacity: 16- 18 Sq Meter/ Liter/ Coat.